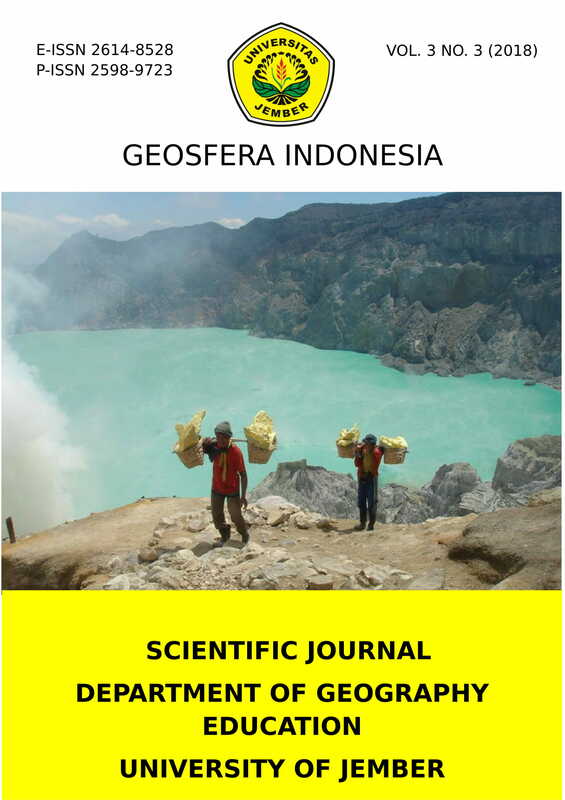 Geosfera Indonesia : | ISSN: 2598-9723 (Print)| ISSN: 2614-8528 (Online) is an international open access and peer-reviewed journal, published by Department of Geography Education, University of Jember, Indonesia. We accept mainly research-based articles related to geography. Geosfera Indonesia welcomes contributions in such areas of current analysis in: (1) Geography Education, (2) Geography (Physical Geography and Human Geography), (3) Geographic Information System (GIS), (4) Remote Sensing, (5) Environmental Science, and (6) Disaster Mitigation. Since volume 1, it is published three times a year in April, August, and December. Geosfera Indonesia : | ISSN: 2598-9723 (Print) | ISSN: 2614-8528 (Online) is an international open access and peer-reviewed journal, published by Department of Geography Education, University of Jember, Indonesia. We accept mainly research-based articles related to geography. Since volume 1, it is published three times a year in April, August and December. Department of Geography Education , University of Jember, FKIP Building Jl. Kalimantan 37, Jember, East Java, 68121, Indonesia.